We bet you just can’t eat just one! 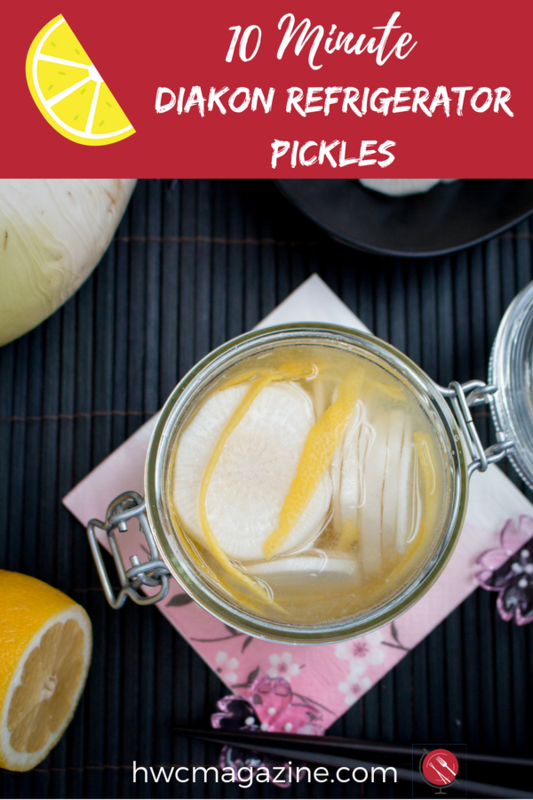 You are just going to love these pickles as they are delicate in flavor, super refreshing and a fabulous palate cleanser from one dish to the next. 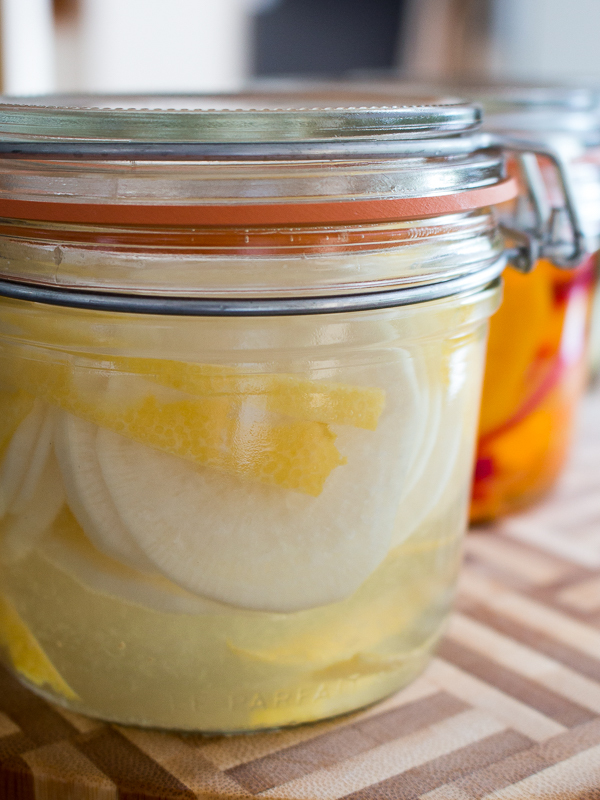 Lemon Diakon Radish Refrigerator Pickles take less than 10 minutes to make, have only 5 ingredients and are going to be your new go to refrigerator pickle. 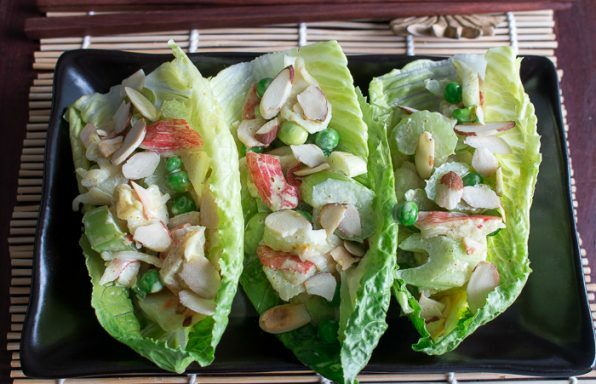 We love them on top sandwiches, salads, or on the side of our favorite Japanese recipes. Be sure to try these Lemon Diakon Radish Refrigerator Pickles in our Wasabi Mayo Crab Onigirazu or alongside our Yakitori or tossed in our Super Easy Crab Salad. We are on a refrigerator pickle roll. If you have not read our Spicy Garlic Cucumber Refrigerator Pickles or our Gingered Red Onion Pickled Golden Beets be sure to check it out. 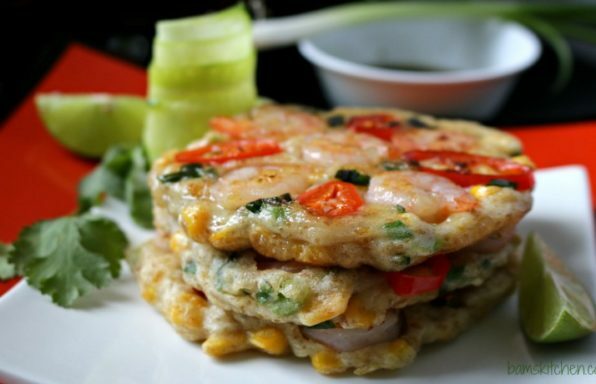 You are going to love that zesty, garlicky, spicy and perfect on top of any sandwich or as a side to any Asian inspired meal. If you have been hitting the Farmer’s Markets be sure to stay tuned as we have one more refrigerator pickle this week that is going to blow your mind. As you know you can use any spice or herbs in refrigerator pickles and citrus is really a nice addition. We chose to use both the lemon zest and juice. 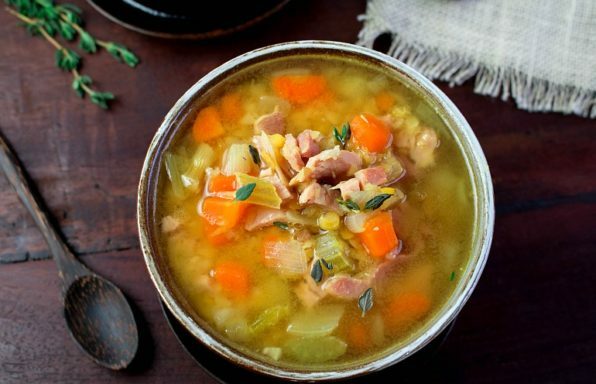 However, please note that the brine will turn cloudy with the addition of lemon juice but it is so DELICIOUS! So who cares?! 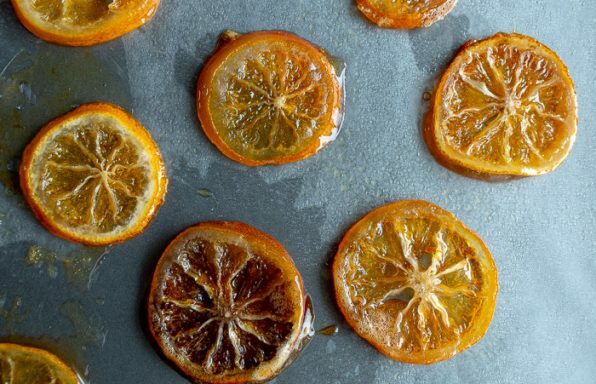 If you are living in Japan and have access to Yuzu, we are totally jealous. 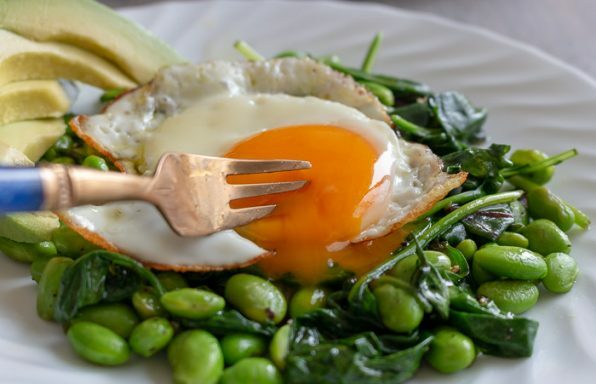 Feel free to add yuzu or Meyer lemons to this recipe as they are super delicious. However, here in the States, yuzu is not an easy citrus to find in the markets. We fell in love with Yuzu daikon pickles in Japan and every time we go back we head down to B1 of the larger markets buy it. However, we must say this recipe Lemon Diakon Radish Refrigerator Pickles hits the flavor notes almost spot on. We are delighted! Diakon is a mild flavored winter Asian Radish. It is long and white. In Cantonese, it is called Lobak. Diakon is really delicious grated into a little ponzu as a dip, cut up into hot pot broth or sukiyaki in our Five Spiced Beef Diakon Noodle Soup , or in our Diakon Salad with sesame dressing and of course do not forget our Chinese Vegan Radish Cake . You can buy daikon radish at any Asian market but we have found them right at our local grocery store in the States. 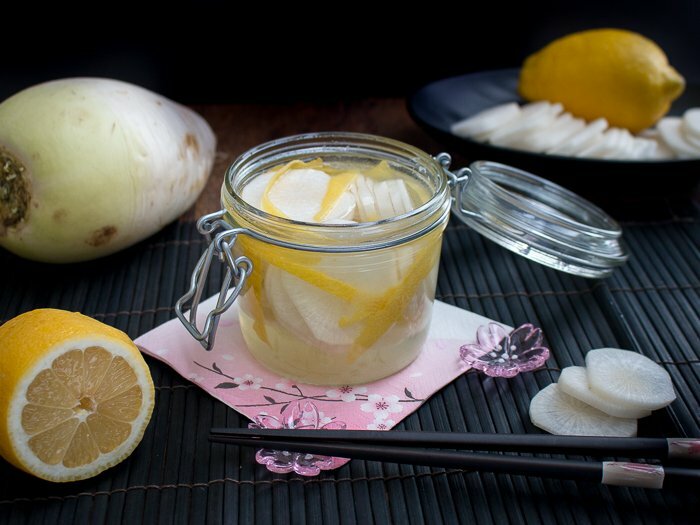 Have you cooked or pickled daikon radish before? 1Wash your hands. Wash your glass containers with lids with soapy hot water, rinse well and air dry. This is to avoid cross contamination. 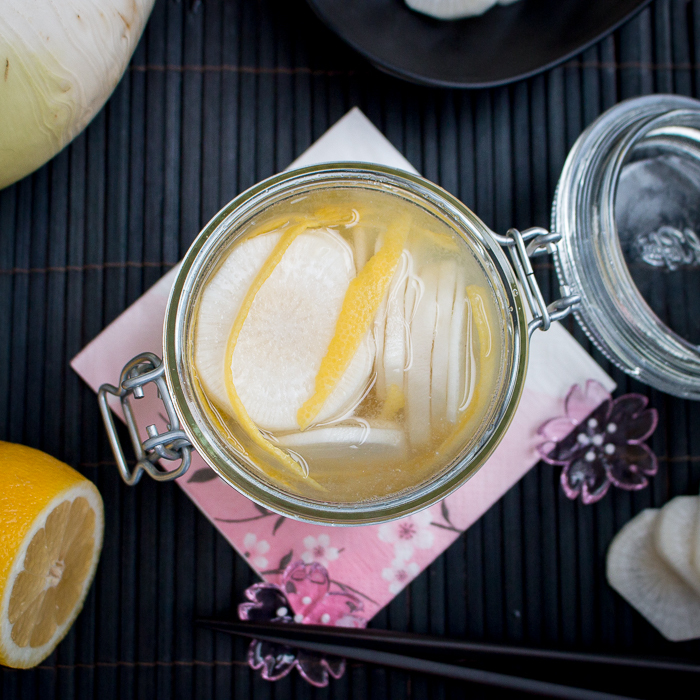 2Place your sliced daikon and lemon rind slices into your glass container. 3Mix white vinegar, lemon juice, salt and sugar- taste and adjust to level of sweetness or saltiness desired. 4Pour vinegar/lemon juice mixture over the daikon and lemon rind until covered and place on the lid. Leave about 1 inch room on top. 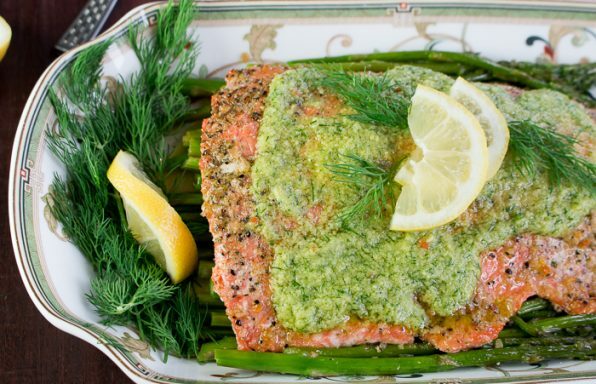 5Refrigerate for at least 6 hours to let the flavors mingle or if you can wait overnight and enjoy. 6Please consume within 1 month and store in the refrigerator.